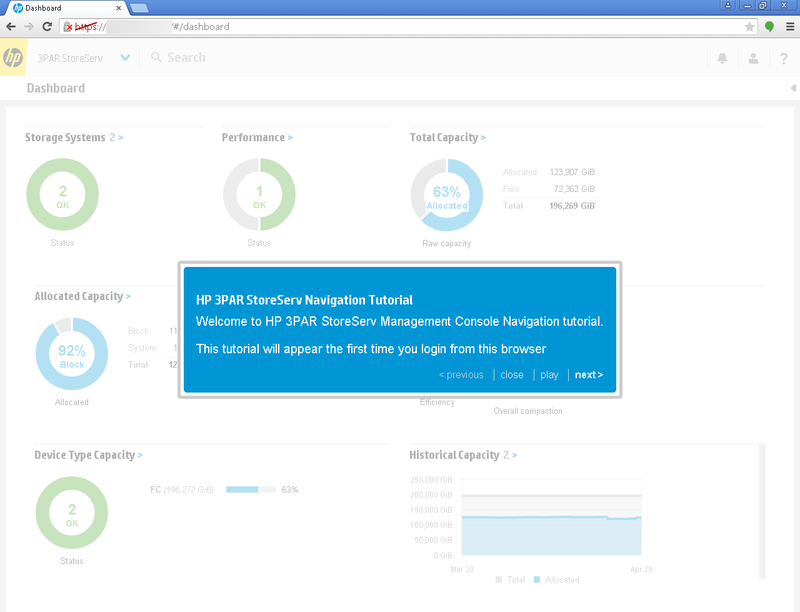 Moving from version 2.0 to 2.1 may not seem like a big jump, but for users of HP’s new 3PAR StoreServ Management Console, the point release is a big deal. 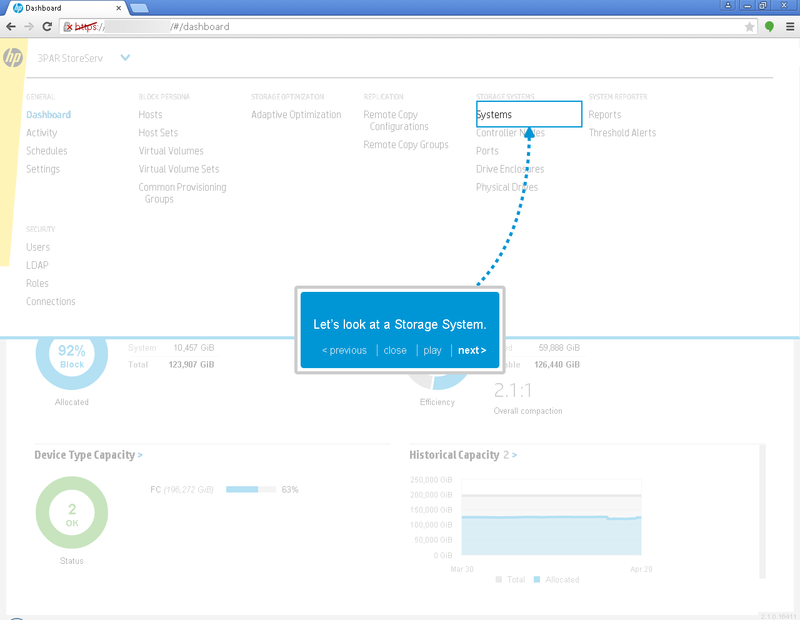 HP’s new release came to customers on April 30 and it included a lot of great new features that complete the toolset for 3PAR administrators. The initial release of SSMC was fairly feature rich, but some specific capabilities were missing and HP has received a long list of requests. With the SSMC 2.1 release, HP is answering a lot of those customer requests. One of the nice features of SSMC is the Dashboard – a quick and easy display of what is good and bad in the 3PAR environment. One capabilities that 2.1 adds is the ability to drill down into the Performance and Device Type donuts. Now in the UI, all of the green/yellow/red donuts have the capabilities and the blue/grey donuts do not as a quick way to know. AO and DO are now configurable within SSMC. Adaptive Optimization and Dynamic Optimization are major features within the 3PAR arsenal and so its no surprise to find them in the new release, however its also a welcome addition. These are found under the Storage Optimization area in the Main Menu. 3PAR traces its origins to service providers and for this market virtual domains exist within the OS to segment and ensure that customer data does not ever cross boundaries. Domain support is now available in SSMC with the 2.1 release allowing this tool to be doled out for customer management. Remote Copy replication gets a slew of additions in the 2.1 release. With this release, you may create 1:1 remote copy configurations, in addition to just displaying the configuration. You may also view 1:N configurations. For shops who can run it, Peer Persistence management is also added in the 2.1 release. Most early adopters of Peer Persistence were relegated to the command line for management, so a GUI interface for management is a welcome change. I’ll be posting a more in-depth view on Peer Persistence management on Tuesday. Tune System or tunesys makes its debut in SSMC with 2.1 release. Tunesys is a management process that rebalances the array and perform housekeeping tasks. This feature is conveniently available under the Systems area of the Main Menu. Users also gain the ability to schedule and email reports. This is a big plus and a feature of the original System Reporter that was missing in 2.0. Quality of Service and Deduplication reporting has also been added to the list of pre-defined formats. 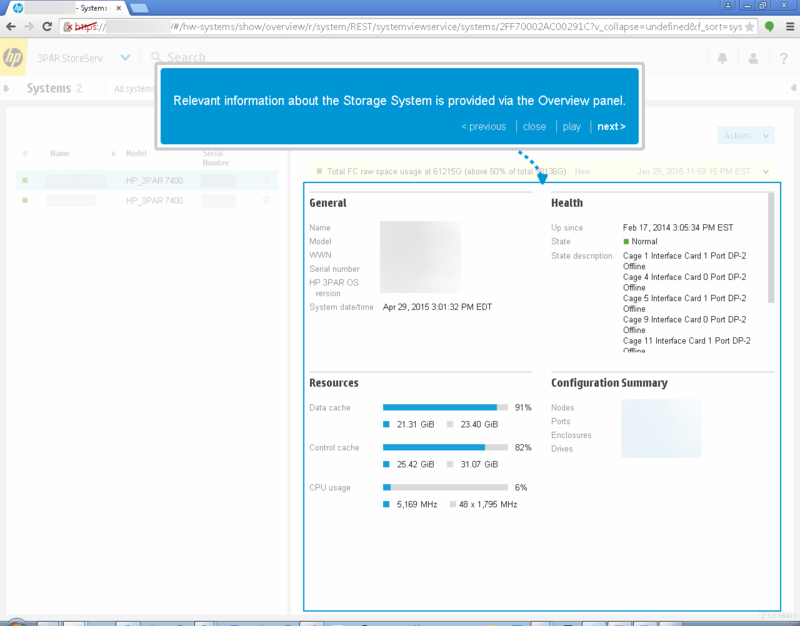 For more in-depth information about System Reporter additions, see the blog post from Ivan Iannaccone on HP’s Around the Storage Block blog. After you complete the upgrade to SSMC 2.1, the first thing you notice is a new introduction to the user interface. For anyone who has not used SSMC 2.0, this is a great way to get to know the user interface and learn how to navigate around. The tour highlights areas of the screen and moves you from screen to screen while explaining what information is found where. Even better than a video or tutorial, the SSMC navigation overview is live with your systems and data in the background. 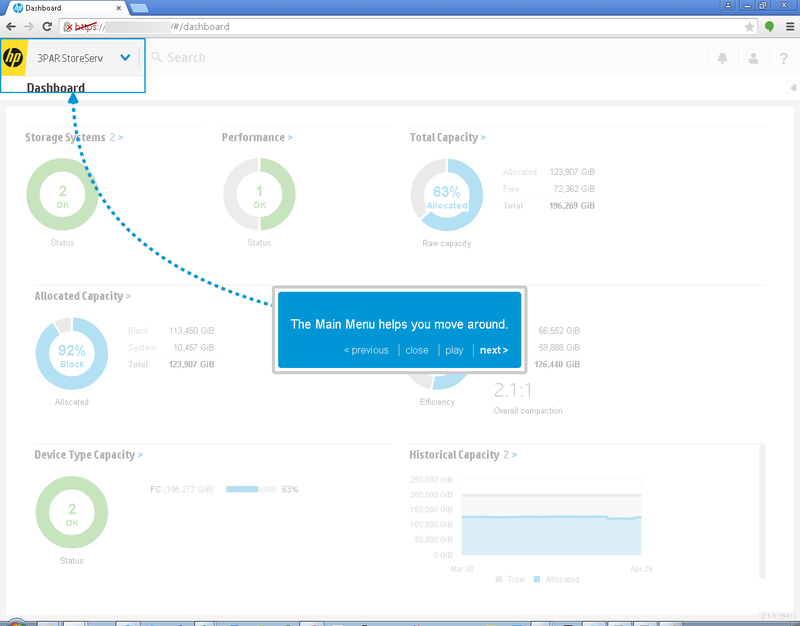 You will see your 3PAR arrays and their alerts of information while the navigation overview takes you through the interface. And best of all, after the one-time introduction, users can always refer back to this navigation overview from the Help menu anytime. The upgrade process for a SSMC 2.0 installation is relatively simple. The installer recognizes the existing version of software and performs an upgrade. It removes the earlier version and then writes the new installation. Interestingly, it also removes and recreates the local user account – the same one that had to have login as service rights added after installation to start on installation.